On 16 May 1970 Wynford Vaughan-Thomas (1908 – 1987), acting in his capacity as President of the Council for the Protection of Rural Wales, performed the official opening of the Pembrokeshire Coast Path at Amroth. Vaughan-Thomas, historian, author and revered radio and television broadcaster, was born in Swansea in August 1908. He was educated at Swansea Grammar School where his English teacher was DJ Thomas, father of the celebrated poet. He studied Modern History at Swansea University and worked for a while as curator of manuscripts at the National Museum of Wales. In the late 1930s he decided on a change of career and went to work as a radio presenter for the BBC in Cardiff. When war broke out in 1939 Vaughan-Thomas was transferred to the BBC in London as a home front reporter, where his moving reports on the blitz led to his being appointed as a war correspondent. Vaughan-Thomas made some notable broadcasts, including one from a Lancaster Bomber during a raid on Berlin and one from the beachhead at Anzio. After World War II Vaughan-Thomas continued his work at the BBC until, in 1967, he took up the post of Director of Programmes at the newly-founded Harlech Television, in Cardiff. 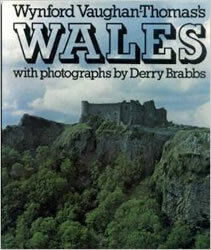 During the 1970s and 80s he was a familiar face in the channel’s broadcasts, particularly on the subject of his beloved Wales and its history. As well as being a renowned broadcaster and raconteur Vaughan-Thomas was the author of a number of books about his wartime experiences and his native Wales. He was also a tireless supporter of organisations such as the Welsh National Opera, of which he was a Director, and the British Film Institute, of which he was a Governor. This brings us to his Presidency of the Council for the Protection of Rural Wales, during which he performed the official opening of the Pembrokeshire Coast Path at Amroth in 1970. Vaughan-Thomas and his family had taken up residence in Fishguard – it isn’t entirely clear to me when and his work probably kept him away from home for a lot of the time – but it is recorded that he died at home in Fishguard on 4 February 1987, leaving his collection of papers and scripts to the National Library of Wales.